Display content dynamically using dynamic panels, variables and conditions. This is a good way to apply progressive disclosure, and show form fields as the user completes them. 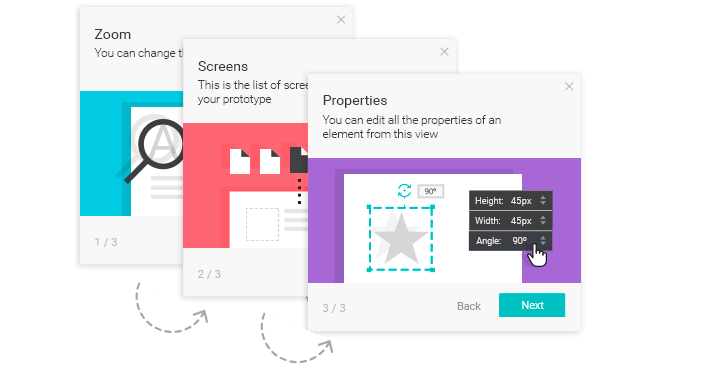 Create effects and animations to simulate different progressions in your web or app prototype. Expand and collapse content, in order to selectively display optional information. Change content on mouse click to show different content in the same screen depending on the user interaction. Create and customize tooltips, a very useful resource for helping your newer users. Include dialogs and pop-ups to interact with your users offering additional information. Create scenarios to model your user cases and navigation flows. So what are you waiting for? Download Justinmind nowand start using progressive disclosure UX techniques in your prototypes now!